Charak's M2-TONE is the most trusted and clinically endorsed formulation for DUB and infertility. These tablets are formulated for treating Menstrual Disorders & Female Infertility. This is Charak pharma's propriety ayurvedic medicine which has time tested herbs that have the reputation of treating female menstrual complaints such as menorrhagia [profuse menses] or dysfunctional uterine bleeding, metrorrrhagia [irregular menses], amenorrhea [absence of menses and unexplained infertility. It treats the endocrinal imbalances and restores normal menstrual function. It regulates and restores normal menstrual flow. Absence of Nausea and Vomiting, Breast tenderness, Headache, unlike hormones. Accute: Two tablets twice a day for minimum three cycles or till conception takes place. 2 x strip of 20 tablets. Total of 40 tablets. this incident is of year 1996 i was suffering with severe endometriosis my condition was that i could have died during my cycles it was so painful i could not conceived but i will tell thanks a billion million to that person who has invented this medicine my problem was gone i conceived and blessed with baby boy. I just want to say that M2 Tone is a life savior for woman. My sister was conceiving, But after taking M2 Tone for 3 months she was blessed with a baby girl. I am really thankful to people who discovered M2 Tone and the doctor who suggested this medicine. 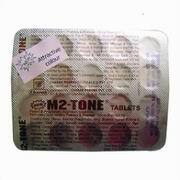 Hi am yasmin,and am using M2-tone and i can say its really great,its one of the drugs that has got no side effects.My question is can i get pregnant while on the drug? Hi I just want to say that M2 Tone is a life savior for ..